This post is part of a series on cinematic combat in Dungeons & Dragons 4E. You can see the others posts in the series here. Thinking about interesting combat scenes in movies, one aspect that stood out is how much the battlefield often plays into the fight. The heroes and villains are never just standing toe-to-toe taking turns swinging at one another. Instead, they stay mobile to take advantage of their environment whether it’s a flight of stairs, waist deep water, factory machinery, or a river of lava. As I try to replicate movie fight scenes in D&D, I’ve been taking a look at how putting more thought into the terrain that I use in an encounter can make each fight more unique and memorable. Difficult and blocking terrain are by far the most widely used, but they are also the least interesting, especially considering that everything from ice to rubble to undergrowth is usually given the same mechanics. Fantastic terrain lists in the Dungeon Master’s Guide and Dungeon Master’s Guide 2 offer some more interesting options for terrain. Some of these overlap with the general terrain types (for instance, Cave Slime is just an example of challenging terrain), but others like Mirror Crystal break from the mold and offer unique options. One problem that I’ve encountered is that most of the fantastic terrain examples are truly fantastic in nature which makes them harder to justify in lower level or less magical settings. Having the high ground on your opponent, whether standing on a table or above them on a staircase, offers a few advantages in a fight, but the D&D 4E rules don’t offer any mechanical advantage for high ground. To remedy that, I’ve taken to rewarding players with a +2 bonus to attack rolls when they hold the high ground in melee. I find that this rule encourages adventurers jumping on top of tables, and that is always a good thing. As mentioned above, the rules assume that difficult terrain covers a wide variety of terrain, but unfortunately the effects of difficult terrain aren’t particularly interesting and I’ve noticed that including a few squares of difficult terrain rarely encourages my players to alter their tactics in order to take advantage of it. In hopes of making combat more fun, I’ve started to put effort into making things that I used to group as simply difficult terrain more interesting. In most cases, just adding an aspect of challenging terrain by requiring a skill check to either avoid a penalty of some sort or ignore the difficult aspect seems to make it more interesting. I really like the terrain power concept introduced in the Dungeon Master’s Guide 2, and I think it is a great way to get players thinking about more creative actions in combat. In addition to including terrain powers when preparing an encounter, I’ve started to compile a collection of standard powers linked to relatively common terrain. For example, I have a draft version of a splash power that would be usable in any shallow water to distract enemies in a close blast. I hope that as players get used to these battlefield-provided powers they’ll begin to automatically incorporate ideas for using terrain more creatively. Instead of revealing prepared terrain powers as soon as an encounter starts, I like the idea of having passive checks to notice them with two tiers of difficulty. A higher DC for a character to know about the option at the beginning of combat, and a lower DC to realize a power is available when the character first moves close to the associated terrain. I like that this will reward characters with relevant skills and that revealing the power’s availability mid-fight can force the players to reconsider their tactics. Arthur’s soldiers, tasked with protecting a noble family, are being pursued by an overwhelming force of Saxons. In hopes of escaping, they decide to confront their enemies at a frozen lake where they can use the thin ice to their advantage. When the weight of the Saxons isn’t enough to break the ice, one of Arthur’s followers rushes forward with an axe to hack at the ice. 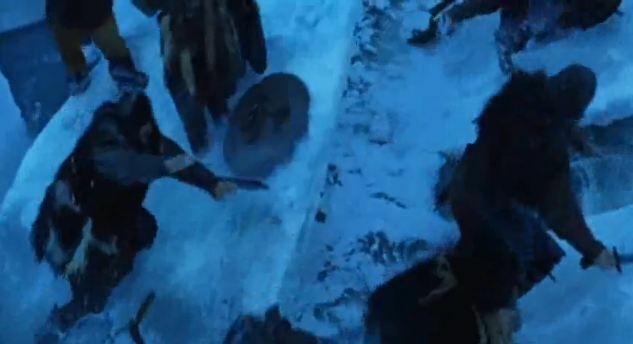 When the ice breaks, the entire lake’s surface becomes unstable, and the Saxons must struggle to stay atop the floating pieces to avoid the dangerously cold water of the lake. In order to build an encounter inspired by that scene in King Arthur, we’ll need a few mechanics for the terrain involved. A character moving on slippery ice has two options: move slow or risk slipping. A character that decides to move slow treats the ice as difficult terrain. A character that wants to move faster instead must make an Acrobatics check against a moderate DC or fall prone on the ice. In addition, any character subject to unfriendly forced movement much make an Acrobatic check (moderate DC) or fall prone at the end of the movement. Thin ice counts as slippery ice and also has a chance to break from the weight of characters standing on it. Group thin ice squares into 2×2 or 3×3 sections. If at the end of any turn, there are at least 4 medium size creatures or 1 large creature in a given section, the section must make a saving throw or break. A DM should feel free to adjust the number of creatures that risk breaking based on the weight of the creatures – for example a medium metallic construct might count as 2 medium creatures. When thin ice breaks, it becomes broken ice terrain. Thin ice can be temporarily reinforced by dealing at least 10/tier cold damage to it with an attack. This prevents the ice from breaking until the end of the reinforcing character’s next turn. Smashing your weapon into the thin ice causes it to crack and break apart. Requirement: You must be on or adjacent to a section of thin ice. Check: Athletics check (moderate DC) to break the ice. Success: The ice breaks apart. Target: Each square of the section of thin ice within either a close burst 2 or a close blast 3. Effect: Each targeted square of thin ice becomes broken ice. Characters in the affected squares must make an immediate Acrobatics check or slip into the water (see below). Broken ice consists of loose chunks of ice floating on the water below. The ice bobs and tips in the water, so a character moving through or ending its turn in a broken ice square must succeed on a hard Acrobatics check or slip into the water below. You nudge the floating chunks of ice causing them to tip and bob in the water. Requirement: You must be adjacent to a square of broken ice. Target: Each creature in the adjacent square of broken ice. Hit: The target slides into the frigid water (see below). Any character that moves into the frigid water of the lake takes 5/tier cold damage plus ongoing 5/tier cold damage (save ends). In order to climb back onto the ice, a character must use a move action and succeed on a moderate Athletics check to enter an adjacent square of solid ice. If no solid ice is available, a character can attempt a hard Athletics check to climb out of the water onto broken ice. If you want to replicate the entire layer of ice on top of the lake becoming unstable, I’d recommend having the broken ice spread outward at a rate of 1 square per round once a certain threshold number of thin ice sections have broken. That expansion of the danger zone should encourage anyone still on the ice to flee to the closest solid ground. Hey Glimm, I just wanted to tell you your D&D 4e posts on cinematic play are excellent. I’m very big on cinematic atmosphere, so you definitely gave me some ideas to help my campaigns. And using one of my favorite scenes here in fantasy-esque movies, the classic frozen lake scene from King Arthur, definitely caught my attention. Great stuff! Hey Glimm, I just wanted to direct you to my real, maintained website and profile – sorry about commenting above while logged in on my defunct skeleton site. I wanted you to know I mentioned Glimm’s Workshop today in my Leonine Roar blog as one of my favorite stops. Thanks. I’m honored to have made your list!